Howdy friends! I am still not ready to jump back into a full blogging schedule, but am thinking when I can post I'm going to focus on three different themes per week - Motherhood Mondays, What I Wore Wednesdays, and Friday Finds. Keep a look out for more posts moving forward! For a lot of women, becoming a mother is something they've always known they wanted from a young age. But for me? I was never really sure. I just was never that girl who was really drawn to kids. I was never particularly interested in babysitting and I think only had two or three gigs where the parents actually left the house. When my friends and I talked about becoming camp counselors, I was adamant about wanting to be the Arts & Crafts counselor and not live in a cabin with the campers. And while I don't remember this, one of my friends insists she remembers me talking a lot about wanting to be a DINK in high school - that stands for Dual Income No Kids. I also just knew me - I'm fairly lazy (never come over to visit without letting me know first, because I have 100 dishes in the sink and am probably unshowered and have something weird and embarrassing sitting in our entryway) and selfish and love my alone time. As I got older and fell in love and got married, I knew a family was something I wanted in my future but I still couldn't quite picture being a mom to young kids. Give me a teenager sure, but a baby? A toddler? What would I do with a little kid? It just has never been something that came naturally to me. 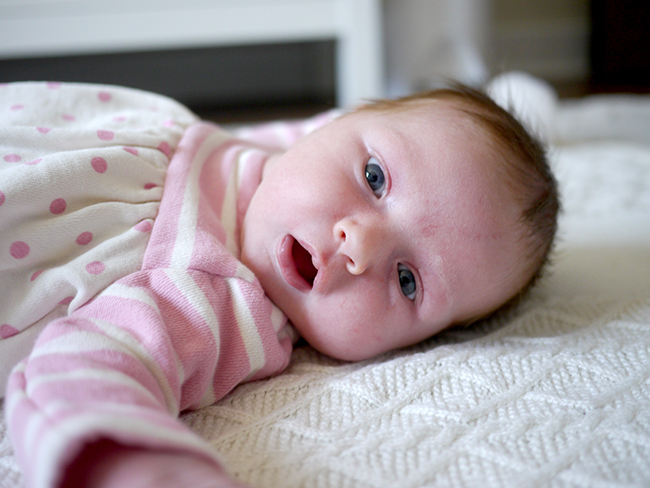 When we got pregnant, I started to worry - would I be a good mom? Would I love my baby? Would I like all of the changes coming to my life? Admittedly, part of the problem is definitely being a little too deep in the blogging world. 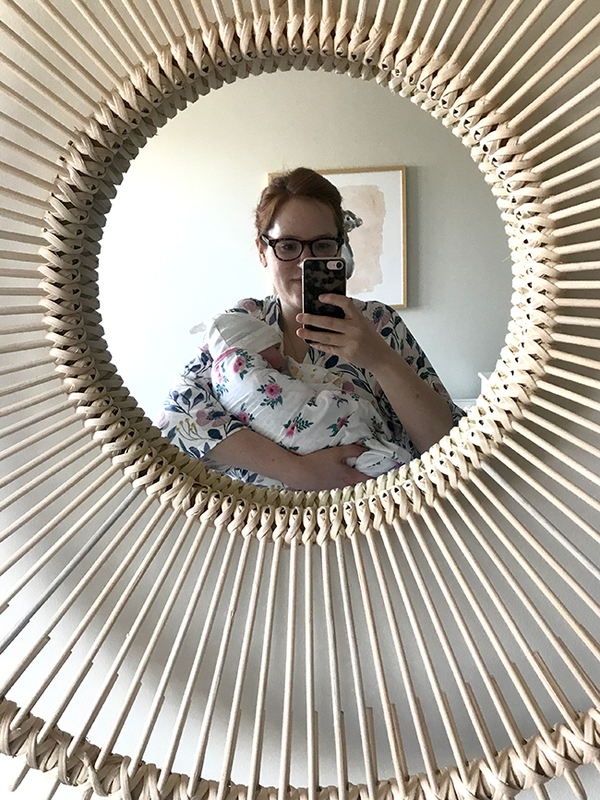 In the age of acceptance and sharing, I had read a lot of personal stories about postpartum depression and having trouble connecting with your baby, and those had me worrying. 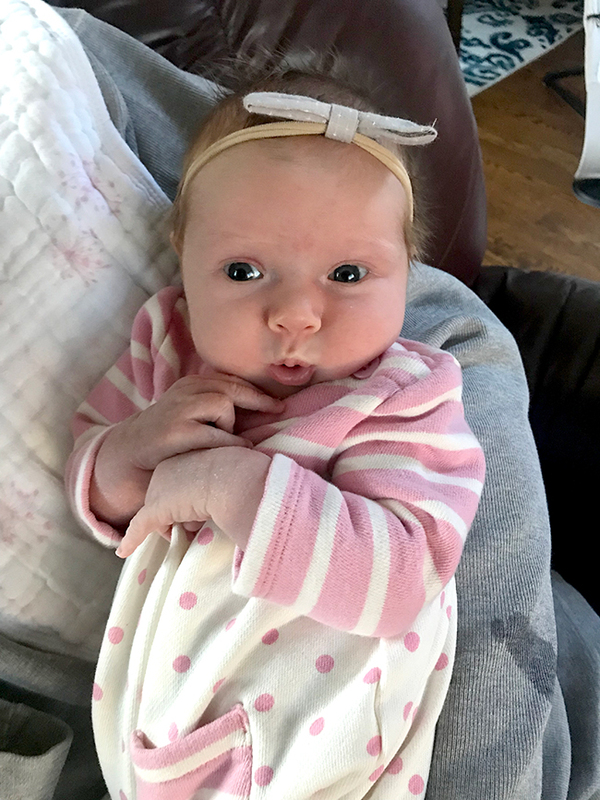 Just like I worried I wouldn't be able to conceive after reading so many stories about infertility, I assumed that the worst would happen to me after the baby came. 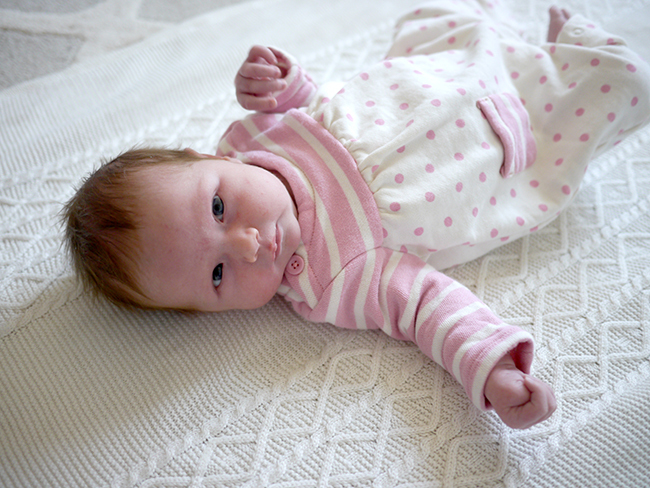 When Mia was born, I immediately started to cry. Partially out of relief, partially out of all of the emotions and hormones. But also out of worry. When they laid her on my chest, I immediately thought, do I love her? Oh no, what if I don't love her? I'm not going to say it was an immediate, overwhelming love that a lot of moms feel because I definitely had a few moments of, "who is this little creature I'm supposed to take care of now?" Day one was exhausting and overwhelming and a bit of a shock. We went from the delivery room to the recovery room and immediately had a ton of visitors who all wanted to hold little Mia, and basically ate dinner and passed out. The first night Mia didn't even spend the night in our room because she kept quietly coughing up and choking on amniotic fluid so the nurses wanted to keep a close eye on her while we slept. So did I love her on the first day? I'm not really sure. But by day two? I was obsessed. We spent the day basically just staring at Mia. I think we turned the TV on just for an hour to watch the end of The Bachelor and maybe took a nap, but the rest of the day we were literally content to just hold her and look at her. And by the time we got home two days later, I was completely infatuated. I was actually sad she was sleeping so much as our pediatrician had told us not to hold her if she was sleeping. 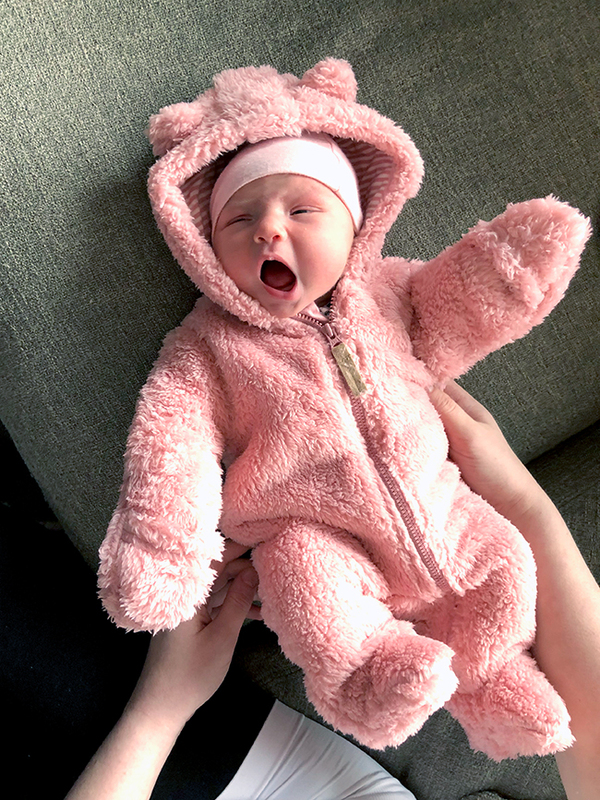 I just wanted to hold her and snuggle her all of the time! I honestly can't believe how much I've loved motherhood so far. I thought breastfeeding would be hard, but I've enjoyed the process and getting to bond with her. I thought I'd be bored sitting at home all the time, but I'm perfectly fine with it as long as I'm sitting next to Mia! Jeff and I literally fight over who gets to hold her and push her stroller, who gets to be in charge of the bath or whose turn it is to rock her to sleep. As long as she's not up for hours in the middle of the night, I'm even excited to wake up to feed her at two in the morning. I just love this little girl so much I don't know what to do with myself. And I'm so excited to see what each week and month and year with her will bring!